How Are Home Foundations Constructed? The Start of construction was fairly swift for our home. We met with our construction supervisor, or builder, the week prior to construction and laid out the location and position that the house will be built. The process took about an hour and we had a good idea of what to expect in the coming weeks as construction progresses. The first stage of any home is obviously the foundation. The site was graded or leveled off, for the base of the house and its surrounding area to sit level and to channel water away from the home when it rains. Our home will be built on a monolithic slabe� foundation, a single piece of thick concrete that supports the entire home. Some homes are built with crawlspaces or basements, depending on the terrain, climate and buyer's preference. The first step for the foundation involved the crew marking the foundation boundaries and digging trenches along them. The trenches are then filled with steel reinforced concrete to make a sturdy platform for the masonry work. The next day after the concrete is poured, masons lays cinderblocks and bricks around the perimeter of the house and the major load bearing points. Oddly enough, at this point, the house looks very small compared to what you might envision it to be. We actually went to the home site with a tape measure to make sure we didn't get a “miniature” version of our home built by mistake. Sure enough, it was the right size, and as we have come to find out, looks will be deceiving throughout the construction process. It is always best to consult the building codes in the locality of your area to check for the best type of foundation for your building. In addition to this, the codes will also help you determine what type of concrete foundation is acceptable, whether it be poured, blocked or post and pier. If you want to apply the standard concrete base then you should be able to find the right plan for putting up a concrete block foundation. 1. Prepare the materials which will be needed; concrete, gravel, iron bars, bricks and wood to be used for framing. After this, begin leveling the surface where you want to build your home base. The backing material for your slab base should be fairly leveled to allow the home foundation to be erected with firm support. This is vital for you not to have further problems regarding your foundation structure later on. 2. Excavate the surrounding of your home base perimeter in order to build a trench. The minimum width of your trench should be 6 inches and its depth should be 24 inches for perfect fitting. Take note that if you are living in an area where the temperature is freezing during winter, it would be best to make your trench base deeper than that of the underlying soil which is considered as the permafrost level. 3. For homes which consist of more than one floor, your trench base should be wider than the normal 6 inches width. To be more exact, you should check the structure codes in the locality for you to be guided accordingly. The geographic locations as well as the condition of the ground are the main factors which must be considered before you dig your foundation trench. 4. It is also necessary to put up a frame for your trench. You may use boards with a measurement of � inch x 8 inches x 10 feet. 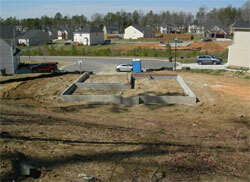 The boards have to be leveled at all times so as to build a perfect frame base for the foundation of your home. You may need to change the level of your frames from time to time as you work your way through digging the trench. 5. To support the trench, put the bricks underneath. You may proceed to fill the dug up area with concrete materials. When you reach the top, level the surface with a trowel and begin removing the boards which was used in framing. Place 4 inches-depth gravel on the internal section of your pad and put plastic sheets to cover the surface and avoid moisture from sipping in.